What would you create if . . . you had no fear? What would you create if . . . there were no judgement or critique of your work? What would you create if . . . there were no one watching? What would you create if . . . you didn't know what would appear? What would you create if . . .
experiences for individuals and groups! The process of creating and expressing ourselves intuitively provides significant benefits such as empowerment, self-discovery, enhanced social connection, increased confidence and much more. It can be a very effective practice for daily stress management, an escape from 'the usual', bring joy and expansion to our lives, no matter who we are and what our lifestyle. My mission is to share the incredible benefits of expressive, intuitive creating with people from all walks of life, to help them leave the 'busy-mind' state, to be more mindful and in the moment. Whether practicing alone or creating together as a group, it is a unique and surprising experience that can strengthen community, build team energy and spirit while also providing the individual with a great tool for creative thinking and problem-solving. I want to light and nurture that creative spark that is there in each of us. I do believe so strongly that an environment where each individual is encouraged to tap into their inherent creativity - from the source of their intuition – that is the environment where the seeds of enlightened progress are planted and nurtured. What we do in the studio is so relevant to life, enhancing our personal wellbeing and that of our community! What could be better for kids, youth and adults than learning this way of being? Tapping into our own intuition, breaking through blocks, creatively solving problems, expressing ourselves independently and authentically from our own source, replacing self-doubt and fear with the excitement of exploration and discovery, appreciating our own unique creativity without judgement, valuing our fellow collaborators - sharing with them and supporting them in their journey, becoming confident in our ability to find and utilize resources. In the studio - we get to delve in, explore, challenge the conditioned thinking that keeps us from our unlimited potential. A more creative, intuitive approach to daily life is something we can all enjoy and benefit from anytime, anywhere! I am now ‘on the road’ in Nova Scotia and able to bring process art to your location! All you need is a space, a few tables and people who want to get together for expressive art fun. I’ll bring everything else we need to turn your place into a creative space! 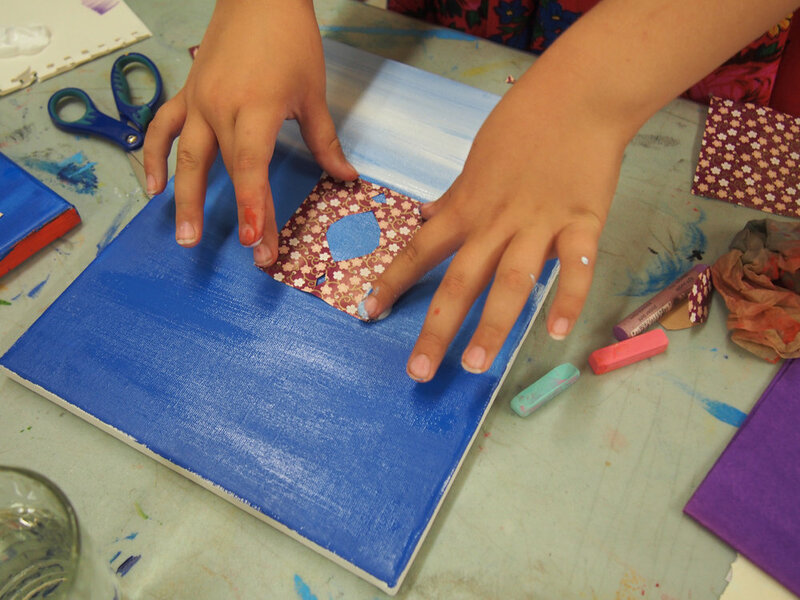 Expressive art happens in a series of at least four sessions of 1.5 or two hours each session. Pricing based on number of people in the group. You can read testimonials about these programs. The arts and culture play an important role in “at least seven of the twelve determinants of health defined by Health Canada” which includes personal confidence, control, social connectedness, education, and a supportive physical environment”. Here, you can also check out the publication entitled The Arts Play a Role in Crime Prevention. It contains some very compelling statistics about the benefits of art participation by youth in communities. Visit the Arts Network for Children and Youth website to check out their very comprehensive links on their Research and Reports page. Of course, the benefits of creating art are not limited to children and youth - they apply to people of all ages and from all walks of life! Check out THIS ARTICLE that will inspire you to get painting or THIS ARTICLE about the benefits of intuitive collage! Check here for information about the benefits of creative art programs for seniors. Read this fantastic article to discover more about the essence of process art. This article reviews a study that shows how creating can reduce cortisol levels and relieve stress. Read the results of Canada's National Art and Youth Demonstration Project here.